Kindly taking time off from answering catfish queries for Practical Fishkeeping Magazine and writing a book on Pufferfish, Chris Ralph introduces this month's featured catfish. As a devoted catfish fanatic for a number of years (probably more than he cares to remember) Chris has chosen to write this month about one of his all time favourites. The Mother of Snails Catfish is not very commonly seen, although if you have kept one of these Doradids, then it is one that you will not forget in a hurry - due to the size to which it can grow. For this reason I have ended up with a small collection of these fish (ten at the last count! ), all rescued from aquarists who can no longer accommodate them. I personally would not recommend that they be kept in any aquarium which is under 72" x 24" x 24", and, really, even this sized aquarium will be eventually outgrown. My collection is housed in a 12' x 48" x 36" tropical pond, which just about allows them space to swim and turn comfortably. These catfish are usually offered for sale as juvenile specimens at around 4" in length. The unsuspecting aquarist will have taken on more than he bargained for, while a genuine enthusiast will already know a bit about these fish and their requirements prior to their purchase. The colour of these fish is basically dark brown to black - hence the name Black Doradid. If you own one of these catfish, you will know that feeding time can be a rather wet experience, even with tight fitting cover glasses, or in my case an open topped pond! I have lost count of the number of soakings that I have had over the years! I purchased my first Mother of Snails Catfish about fifteen years or so ago. The first one that I owned was around 10" long SL (25cm) and very rapidly outgrew a 72" x 18"x 18" aquarium. I eventually purchased a larger aquarium 72" x 24" x 36" and went on to keep this fish for a number of years. When the fish died from bacterial infection it was almost 28" in length, and would have required an even larger aquarium before long. This was really the main reason behind the construction of the tropical pond, although I must admit that I had not envisaged keeping 10 all at the same time. The Mother of Snails Catfish belongs to the Family Doradidae, all of which originate from various locations throughout South America. Occasionally amongst imports of Oxydoras niger there are some slightly different specimens which tend to have black coloured fins and a grey coloured body. These so-called contaminants are Oxydoras holdeni. One of the main characteristics of the Doradids is the presence of thorn-like projections along the side of the body, which are known as scutes. These scutes are very sharp, so care should be taken when moving these fish. 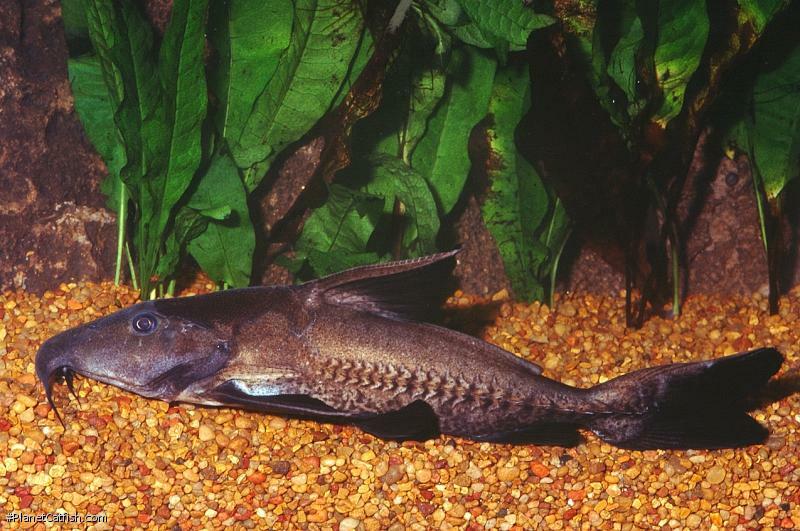 These razor sharp scutes give rise to another of the fishes common names - the ripsaw catfish. This name tends to me more commonly encountered in the US. 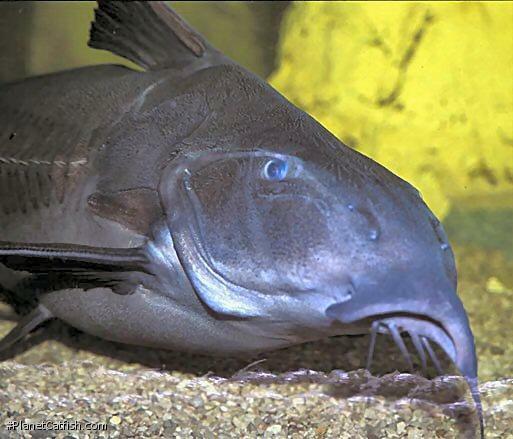 Sometimes literature refers to the Doradids as "Talking Catfish" due to the fact that they can be heard to make audible noises, almost as if speaking to one another. 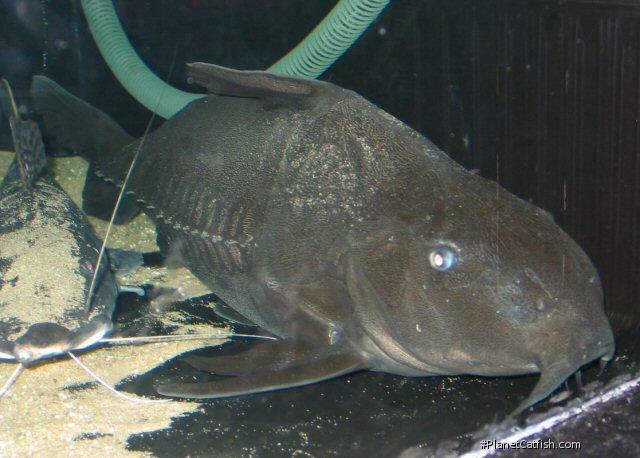 As yet, there are no records of these catfish having been successfully bred under aquarium conditions. Perhaps with the space available to my collection of these fascinating fish, it may just be a matter of time before I witness some kind of spawning activity. I will of course record my observations. Dr. Rudiger Riehl & Hans A. Baensch. Aquarium Atlas Vol. 2. (Baensch - Tetra Press 1993). Type Locality Probably South America [Río Saint Francis, Brazil]. Identification Occasionally amongst imports of Oxydoras niger there are some slightly different specimens which tend to have black coloured fins and a grey coloured body. These so-called contaminants are Oxydoras sifontesi. Sexing There are no known external sexual differences. There are however some thoughts and suggestions that there may be some differences in the shape of the bony plates which extend from the head to the edge of the pectoral fins. It has been suggested that the male has a more pointed plate, whilst the female has a more rounded plate. There is no scientific evidence available to support or refute this observation. Distribution Amazon region, Peru, Brazil, Rio Purus, Rio Sao Francisco. Feeding Readily accepts all manner of prepared foods. Sinking Catfish Pellets are high on the list, alongside floating pellets and sticks, as well as frozen bloodworm, chopped mussel and earthworms. Furniture Large pieces of bogwood and clean plastic drainpipe of suitable diameter for them to hide under. Ideally heater guards should be provided in order for the fish not to burn themselves. Compatibility A real "tankbuster" if ever there was one. Quite a character; obviously suited to large accommodation especially if keeping a number of fish together. Peaceful towards other fish and members of its own kind. Suggested Tankmates Other doradids such as Spotted, Striped (or Humbug) talking catfish. This fish is truly peaceful and can be trusted with fish of smaller size although anything without armoured or other defence and smaller than around 20% the size of the catfish is risky. References Voyage de Humboldt et Bonpland v. 2 (Title page 1833), pp184. There are 50 registered keepers, view all "my cats" data.